With the Vue, you and your business can have video-backed peace of mind. Ever want a quick peek at what's actually happening down at the shop? Then check out the Vue Personal Video Network from San Diego-based Avaak. For about the price of a cell phone, this wire-free, self-installable video system gives business owners a video feed of anything from their back office to the office in the back of their house. 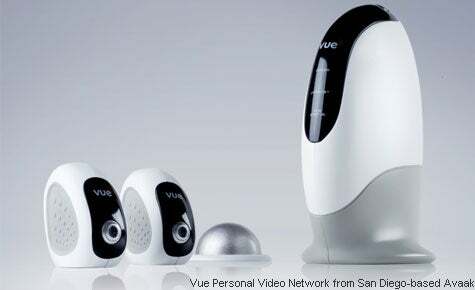 The Vue, which tosses a decent-quality video stream up on any broadband web connection, is based on a proprietary, ultra-low-power video transmission spec developed with $8 million in funding and grants from the U.S. Department of Defense that would give soldiers low-cost cameras they could leave behind in the field. "For the consumer, it's a zero-configuration device that reduces the friction for putting video into just about any location," says Avaak founder Gioia Messinger. The Vue comes with two cameras for $299, plus $20 for service after the first year. It has its charms--it can run for a year on a single battery, for one--but it does take some getting used to. The system doesn't offer a live video feed; rather, it streams images only when prompted. Although the video quality is surprisingly good, it is nowhere near a high-end video system. Yet for a fraction of the cost of a full-featured security system, you can get a live glimpse of your home, your office--maybe even that new employee who gives you a weird vibe.